High in the San Bernadino Mountains of California, in the tiny town of Skyforest (what better name for a town with a monorail?) 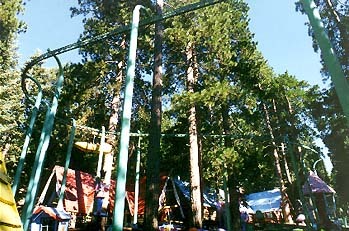 is a children's amusement park named Santa's Village. 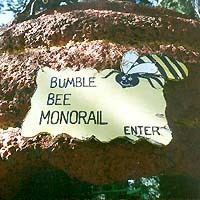 Winding among the thirteen themed rides at Santa's Village is the Bumble Bee Monorail. While this small suspended system is essentially unremarkable from a technical standpoint, historically it is a wellspring of interest. Support lines matched those of surrounding trees. Constructed in 1962 by American Crane & Hoist, this system was the test-bed for the larger-scale suspended monorail at the 1964-655 New York World's Fair. While the World Fair system's seven two-car trains could easily accommodate far more passengers on one train than could be carried on all six of Santa's cars, the AMF-built system loses in the "visually interesting" category to the 'Bee, which easily earns a place in this column. 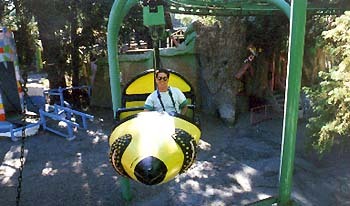 Author Dave takes his final ride on the Bumble Bee. Santa's Village has four-passenger monorail cars happily swinging from their roughly one thousand feet of overhead track. Far more interesting is that the cars are designed and painted to look like bumble bees, complete with black and yellow stripes and bulging eyes. Unfortunately, the slowly flapping wings were ditched long ago because of poor reliability, not to mention clearance problems from the maturing trees along the right-of-way. For the $27,000 invested, this family owned amusement park has easily gotten its value out of this thirty three year old monorail.